Introducing the new Winc Copy Paper! 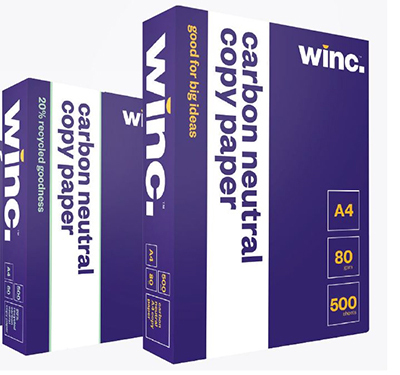 Winc A4 Carbon Neutral Copy Paper is an Australian Made all purpose office paper which is now also certified carbon neutral under the National Carbon Offset Standard (NCOS) Carbon Neutral Program. A product can only be classified as carbon neutral if its manufacturer has accounted for greenhouse gas emissions associated with the product’s lifecycle via an independent audit, demonstrated an emissions reduction plan, and then offset by investments in greenhouse gas reduction projects. Australian Forestry Standard (AFS) and PEFC certified, Winc A4 Copy Paper is an ideal value for money choice suitable for all copying and printing needs. Choosing Australian made paper can have a significant impact on an organisation’s sustainability and environmental goals.